Make Sure Seniors Get the Nourishment They Need – Sign them up for CSFP Boxes! Make sure every eligible client is signing up for this helpful program. Help us spread the word. Let’s make sure every food insecure senior uses this service. With your help, we can make sure seniors aren’t going hungry. · Do not serve expired clients until you have recertified them!! · Please complete your inventory tracking form 100% without any blanks!! · Late paperwork could jeopardize participation in this program. If your site is done distributing CSFP boxes prior to the end of the month, please turn in your paperwork no later than 3 days after your final distribution! Absolute deadline for all paperwork is the 1st of each month; NO EXCEPTIONS. Please let us know if we can help you in any way. Thank you for all you do for our seniors! Click here for CSFP Flyer. We’ve teamed up with United Healthcare to help low-income neighbors learn about their no cost program. This resource is available to individuals that receive both Medicare and Medicaid assistance. Click here for United Healthcare Flyer. Totes of Hope® Partners – Hand out Double the Totes before the Holiday Break! Our warehouse and parking lot are busy places. When picking up your order, watch out for other vehicles and use caution around large tractor trailers. When large trucks are docking, be patient and allow them to finish their maneuvers and dock before driving in front of or behind them. Please wait for them to wave your vehicle through or make sure the truck comes to a complete stop before you pass them. Share this reminder with all your shoppers and drivers. Let’s have a safe winter! Our Outreach Division is excited to introduce Brittany Feltenberger, our newest Outreach Representative. Brittany was drawn to FBR after learning about how we help while working at one of our partner agencies. She grew up in a military family and moved often. Living in Colorado about 6 years, Brittany enjoys hiking and spending time with her dogs. Her favorite part about working at Food Bank of the Rockies is the family feel we have in the organization. Please join us in welcoming her to the team. Are You Sharing Special Holiday Items or Distributions? Can we direct clients to your agency for additional holiday assistance? We often get calls from neighbors needing extra help this time of year. If you’re offering holiday boxes, meals, turkeys, toys etc. please let us know so we can spread the word and holiday cheer. Click here for holiday form. Clients of Denver Human Services can receive help with toys for the holidays. If you work with these families, please share the flyer! Apricot Smoothies and Chicken Bake! Check out these tasty recipes using items from this month’s TEFAP offering. During the winter months it can be hard for people to maintain a well-balanced diet. From holiday food to heavy comfort food, this time of year is especially challenging. Below is a list of vitamin packed and nutrient filled foods to help support our bodies and immune systems during a time when germs are at a high. The benefits: Vitamin C has the ability to boost immune systems. A healthy immune system is the first light of defense when our bodies are fighting off viruses. Foods containing vitamin C: Citrus, broccoli, Brussel sprouts, cauliflower, leafy greens such as spinach, kale, and butter lettuce. *For health concerns, please avoid romaine lettuce. The benefits: Iron helps to preserve many functions in the body, including general energy and focus, gastrointestinal processes, the immune system, and the regulation of body temperature. Foods high in Iron: Legumes, red meat, tofu, lentils, dark chocolate, nuts, dried apricots, broccoli, spinach, and turkey. Remember, eat well and stay healthy this winter! This will make the holidays more enjoyable. 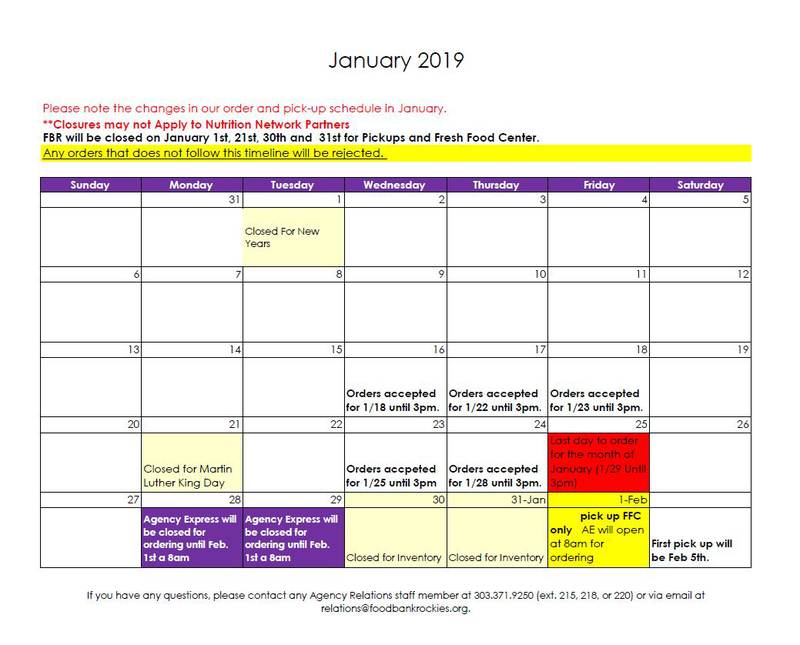 Take a look at the Agency Relations Calendar for 2019. FBR will be closed at 11:30 on Friday, December 7th, and all day on the 24th and 25th. We will also be closed on Monday, December 31st for month-end inventory.